1000Bulbs.com is discounting top-selling products and name brands before Black Friday to give shoppers more time to save on discounted items. We want to give our customers the opportunity to make the switch to more energy-efficient lighting at affordable prices without the stress of the in-store experience. 1000Bulbs.com is discounting many of its top-selling products, continuing its tradition of offering deals for Black Friday and Cyber Monday before Thanksgiving. The sale begins Monday, November 20th and additional discounts are scheduled to be unveiled on the following Monday, November 27th. This year, customers can use a single coupon code to gain a 10% reduction in price for entire brands or product categories. Shoppers preparing for the holiday season can use the code “BF2017” to save on LED mini lights and larger incandescent or LED replacement bulbs, available in 10 solid colors and multi-color options. Homeowners that are upgrading to LED, can use the same code for 10% off the company’s most sought after LED brands: Green Creative, Soraa, Euri Lighting, and Lighting Science. They can also save 10% on all antique bulbs and accessories as well as retrofit their recessed lighting with discounted LED downlights. Decorative LED chandelier bulbs begin at $1.99 each, while a 4-pack of CFL bulbs is only $0.99 per bulb. Commercial customers and business owners can take advantage of even larger discounts. Cases of T8 LED tubes begin at just $5.49 per tube. The Halco 2x4 LED panel for interior lighting is $49.99, $50 less than its retail price. An Acuity LED shop light will only cost $16.99 while LED flood lights, corn lamps, and area lights are all 10% off with the coupon code. More bargains will be revealed on Cyber Monday, including the return of $1 standard shaped LEDs and the 175-Watt equal LED wall pack, a customer favorite, can be bought for the new low price of $64.99. 1000Bulbs.com stocks a wide range of quality lighting and electrical products conveniently priced for the budget-savvy consumer. Customers can skip the hassle of an in-person dash to the checkout line and shop online with 1000Bulbs’ easy ordering process. It ensures products are shipped right to customers’ doors. 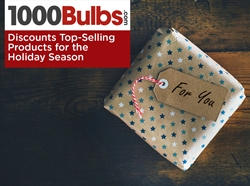 For a full list of this year’s deals, visit the 1000Bulbs.com site.